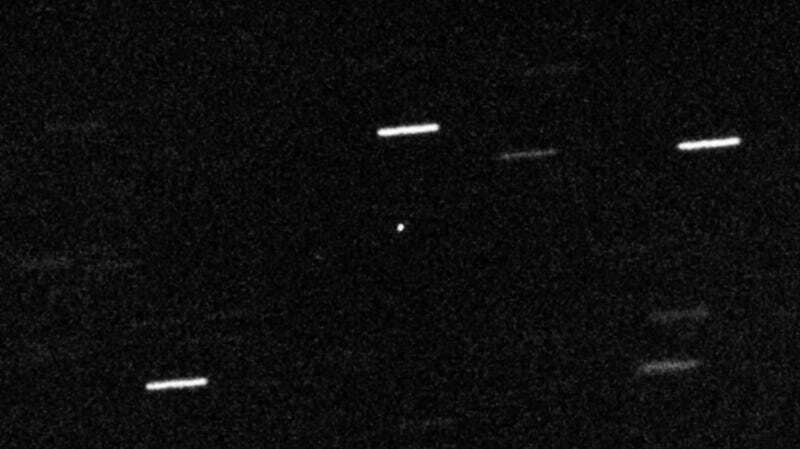 ‘Oumuamua as spotted by the William Herschel Telescope. The first interstellar object to visit the Solar System “defied expectations” in 2017, according to a new study, and brought about lots of questions, including whether it was a comet or an asteroid (or, as some people wanted to believe, an alien spaceship). Though some studies have determined it was an asteroid, new research finds that the comet hypothesis might still be plausible. ‘Oumuamua first appeared on October 19, 2017, in data from the Hawaiian Pan-STARRS telescope. Rather than orbiting the Sun, its trajectory clearly implied that it had visited from outside the Solar System and then left. Though it didn’t stay for long, scientists were able to make 818 observations of the object and found a few strange things. It had an elongated shape with a complex rotation. And strangely, it was accelerating as it sped off—more than what would be caused by the effects of the Sun’s gravity alone. Debate has raged as to whether the rock is a comet, an icy body from the outer regions of a star system with a sort of fuzzy atmosphere and a tail; an asteroid, a rock without a tail that formed closer to its star; or something else entirely. Even though the release of gas from the surface (like from a comet) could have explained the anomalous acceleration, ‘Oumuamua didn’t have an observable tail or observable carbon gas spewing from its surface. This made scientists wonder if maybe it was something else—maybe even a flat object like a solar sail accelerating thanks to a push from the Sun’s particles. But a new paper from Yale’s Darryl Seligman and Greg Laughlin and CalTech’s Konstantin Batygin, slated to be published in The Astrophysical Journal, puts the brakes on this speculation. It reiterates that “a volatile-rich gas-venting structure for ‘Oumuamua provides the simplest explanation for its odd trajectory.” In other words, even though we didn’t see the gas or tail, it otherwise looks just like a comet. This paper simulated an elongated pill- or capsule-shaped object emitting a nozzle-like jet of vaporized particles, mostly water vapor, which might explain why we didn’t see any tail. The model produced results that looked much like those observed in ‘Oumuamua, including the tumbling behavior and extra acceleration. Unsurprisingly, initial opponents of the comet hypothesis aren’t convinced by the new results (are people ever convinced by opposing arguments anymore? ), reports Scientific American’s Lee Billings. Harvard’s Avi Loeb said that the new findings are based on the assumption that extrasolar objects act like Solar System objects, while the University of Cambridge’s Roman Rafikov said the paper requires the comet to be an ideal shape. So, not much has changed, and astronomers still disagree about the nature of ‘Oumuamua. Hopefully, more interstellar objects will visit the Solar System soon, providing us with more to study and debate over.